The mystery of Rosamund Hodge’s Crimson Bound meets the romance of the best Beauty and the Beast retellings. An old tale tells the story of how a little man named Rumpelstiltskin spun straw into gold and tricked a desperate girl into trading away her baby. But that’s not exactly how it happened. The real story began with a drunken father who kept throwing money away on alcohol and women, while his daughter, Aoife, ran the family farm on her own. When he gambled away everything they owned to the Duke, it was up to her to spin straw into gold to win it all back. With her wits and the help of a magical guardian, she outsmarted the Duke and saved the day. 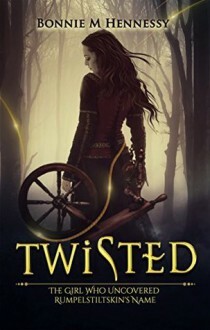 Well almost…Her guardian suddenly turned on Aoife and sent her on a quest to find his name, the clues to which were hidden deep in the woods, a moldy dungeon, and a dead woman’s chamber. Her feelings for one of the men who tricked her from the start threaten to complicate everything. Not the tale of a damsel in distress, this is the story of a tenacious, young woman who solved a mystery so great that not even the enchanted man who spun straw into gold could figure it out. Not until Aoife came along.